eBay says without software Skype's "business... would likely not be possible"
LONDON, England (CNN) -- A legal battle has put the future of Skype in jeopardy, according to eBay, which owns the online communications system. 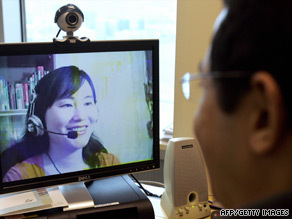 Skype's online phone and video communication service has been incredibly popular. If Skype loses the right to use a key part of its software and can't create an adequate replacement, "Skype's business as currently conducted would likely not be possible," eBay said in its quarterly filing with the U.S. Securities and Exchange Commission. There is no sign of Skype disappearing soon -- a relief to the more than 480 million registered users who have video or telephone conversations online through the technology. But the battle with Joltid, the company that created the piece of technology at issue, shows no sign of being resolved anytime soon, either. Joltid complains that Skype broke its licensing agreement to use the technology. Skype filed suit against Joltid in Britain, saying it could not terminate the license agreement; Joltid struck back with a counterclaim saying Skype had broken the agreement. A trial is scheduled for June 2010, eBay said in the SEC filing. "Although Skype is confident of its legal position, as with any litigation, there is the possibility of an adverse result if the matter is not resolved through negotiation," eBay writes. "Skype has begun to develop alternative software to that licensed through Joltid. However, such software development may not be successful, may result in loss of functionality or customers even if successful, and will in any event be expensive." In an e-mail to CNN, Joltid said Skype "accessed Joltid's source code and modified it -- Joltid then claimed a breach of license." Skype denies any breach. "Joltid is enforcing its rights in the courts," Joltid said in the e-mail. "Like any member of the creative industries, Joltid will defend its innovations with determination." CNN's Diana Magnay and Josh Levs contributed to this report.